Do you need some big building demolished to the ground? Are you in need of a professional demolition company in Houston to take care of that commercial property of yours? 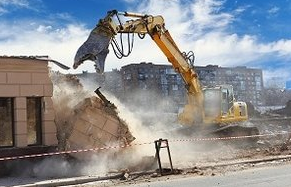 Then you have come to the right place, as Houston Demolition Pros is your best option for demolitions, deconstructions and debris cleanup in Houston, Texas. Not only do we have an extensive track record and a truck load of experience (25 years) but we also have the most updated and upgraded demolition fleet in the Houston area. We are an equal opportunity employer, which means that we hire the best of the best in the city. In many cases, we will bring in people from other places in Texas, just to take care of you! That's right...personal care and a great deconstruction project are guaranteed. No matter if your building is 10,000 or 100,000 square feet (or a Giga project with multiple stories) we will take it down efficiently, in a safe manner and in a timely manner. The techniques to be applied vary: from implosions, to excavators and bulldozers. All permits are taken care of, before we even consider blowing up your building, and we always follow the local and Texas laws regarding demolitions. We have a liability insurance coverage and workman's compensation of up to $1,000,000. So you know that we are the company, the only demolition contractor in Houston, TX that can take care of itself if things go south.